Isaac Newton is a man who should need no introduction. He invented Calculus and discovered the Laws of Motion etc etc. Kids remember the story of the apple falling from the tree…hopefully kids remember. 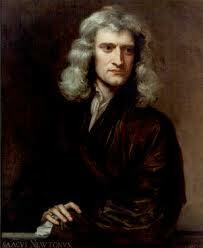 Anyway, Newton is the most esteemed scientist, up there in the pantheon with Einstein. (Kids remember him with the crazy white hair) Does it bother the Materialists that he studied alchemy HARD for many years? Nope. They say he was just curious and abandoned the study after he realized it was all BS. LOL. I notice the same hard-core scientists say nothing critical about Newton’s fervent religious beliefs. They can “forgive” him for that, but not for the alchemy. Let us keep both the baby AND the bathwater. We may find something valuable there in the muddy midst. Newton was convinced that as much as he knew about the “nuts and bolts” mechanics of the world, the orchestration of all matter must be presided over by an intelligence. His alchemy experiments only suggest that he was looking for the link between matter and god. Modern physicists find themselves in a similar bind. Most have rejected the idea that there is a god who set the clock ticking in the first place, but the mysteries of subatomic particles continue to plague them. String Theory is an exciting development over the last 30 years or so that attempts to explain some of the weirdness that goes on at the nano-level of reality. I read Brian Greene’s “The Elegant Universe” some years back, and delighted in how close physics and “magic” had become, especially if you use the definition that magic is science you don’t understand. Does your iPhone work like magic? I watched Greene’s beautiful Nova presentation “Fabric of the Cosmos” recently and waited for someone to say the word, “consciousness”. Nope. It is not Newton’s god, but consciousness that is lurking in the bathwater. The ancient philospohers knew that consciousness plays a part in all manifestations of matter in the universe. Some physicists did too: David Bohm , who consulted with Indian guru J. Krishnamurti to see how much physics and mysticism had in common. Dr. Fred Alan Wolf has quite a few things to say about this as well, and he will make you laugh. Our new physicists are modern alchemists whether they want to believe it or not. Read more about how mind and matter connect.